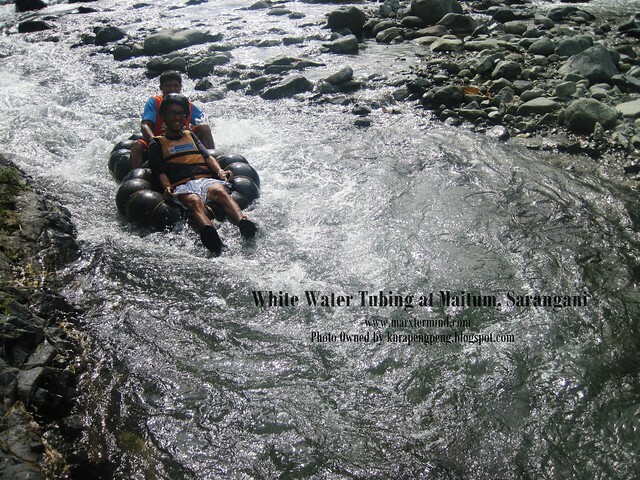 What made me go to Sarangani is the White Water Tubing. Sarangani was made famous by Manny Pacquiao but this province is more than just about him, there are plenty of places to explore and adventures to try. And White Water Tubing is one of them, it is similar to white water rafting but instead of a raft you’ll be sitting on a tube solo while traversing the river. Not that really solo since you’ll be accompanied by a guide on your back. 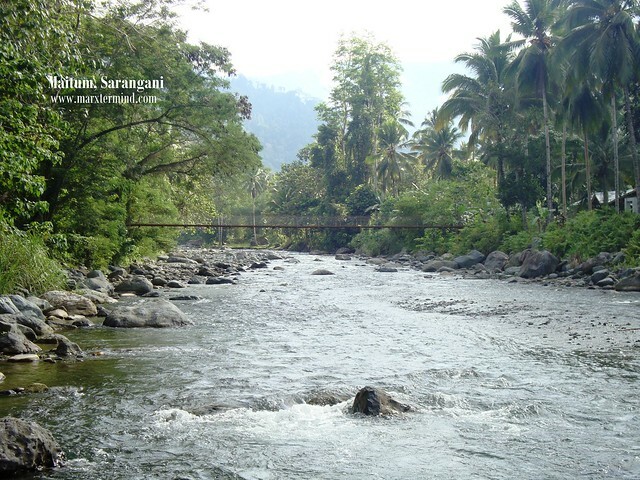 How to go to Maitum, Sarangani? From Amigotel, we rode a tricycle to get to Ablog terminal, fare is PHP 10.00 each. From the terminal, there are vans available that goes to Maitum, Sarangani. The first van leaves at 6:00 AM but it leaves early when it gets full. Speaking of, don’t be shocked if you’ll see number of passengers loaded in the van more than its capacity. Sometimes they load 4 to 5 passenger each seat rows, even the front seat could be loaded with 4 passengers excluding the driver. 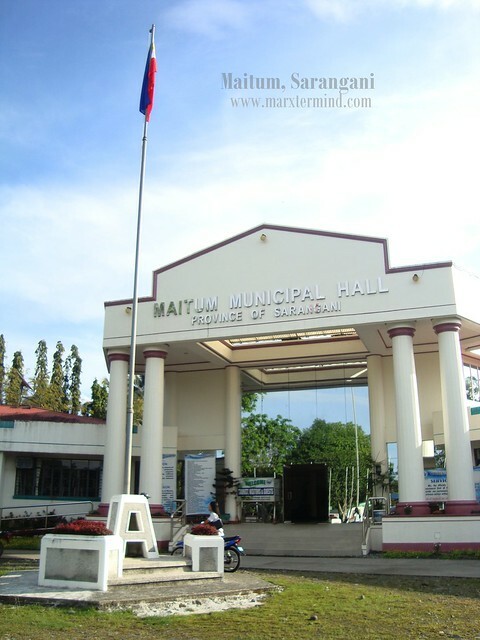 Maitum is 127 kms from General Santos City. The van fare going to Maitum, Sarangani is about P150.00 with 2 hours travel time. Since we left General Santos City a quarter after lunch, we arrived in Maitum, Sarangani at around 3:00 PM. I wasn’t actually worried about our transport going back assuming there are still vans that goes back to General Santos City by night but just to be sure we approached the dispatcher seated in the terminal area and asked if what’s the last trip going back to General Santos City. He told us it was 4:00 PM. There are no other options to get back to the city but by van. So we panicked a bit. We have no choice but to get back to the city before 4:00 PM. Waaah! I felt dismayed but then again I got into thinking that I’ll be able to come back here some other time. So we hopped in to the van. After a little while, it left en route to General Santos City. If there’s one thing I realized from this trip then it would be creating a contingency plan. Not everything happen as planned and we should have an alternative plan. But if you’ll try and struggle for that thing to happen then it’ll occur. We could have an option to stay overnight in Maitum, Sarangani but our bags were left in our hotel room. So the other option I have in mind was to cancel our homestay in Lake Sebu and do this activity on our last day before we depart to Manila. And so we did. Well, we were still able to experience White Water Tubing after all, sooner than what I’ve thought. So we spent our last night in General Santos City instead of doing a home stay in Lake Sebu. We woke up early as 4:00 AM and took the first trip to Maitum, Sarangani. We arrived at 7:30 AM and headed to the Municipal Hall. Unfortunately the Municipal Tourism people aren’t there yet, they will still be arriving at 8:00 AM. We couldn’t wait any longer so, one of the personnel in the Municipal Hall kindly accompanied us to the terminal to get a ride to New La Union. Mopeds for rent (habal-habal) are the common transport to get to New La Union but me and Maricar opted to hire a tricycle to get there. Maricar might have been tired from all motorcycle rides we did during our entire trip so she opted for tricycle. We were charged PHP 250.00 back and forth for the tricycle ride. It was almost an hour travel to get to New La Union, a rocky and bumpy ride to reach the unfrequented place. 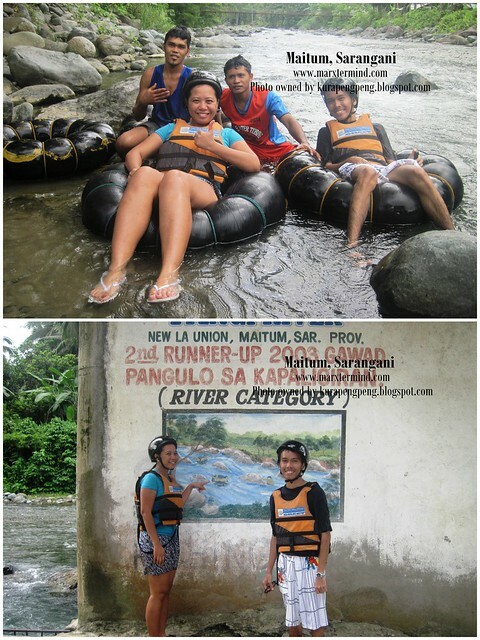 New La Union is gateway to Pangi River, where the White Water Tubing takes place. The ride is about 1.6 kilometers which lasts for about half an hour. 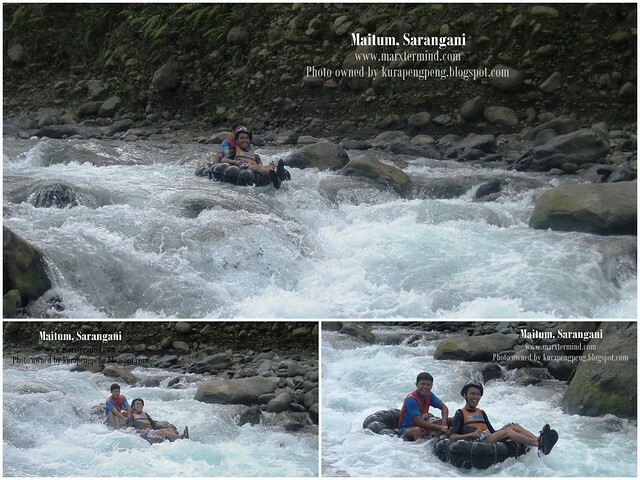 The activity costs PHP 150.00 including usage of life vest and tubing and guide fee. As expected, we were the first guests. Actually we were the only guests that time, it might be off peak season or we’re just too early. After a couple of minutes or so the staff came over and accommodated us. Guides started to approach as well in the area. We put on our gear. Then, rode the moped to get to the starting point. Oh my, this could be my most risky motorcycle ride. We were 5 people riding in a single moped, also add the four tubes carried by the guides. I can feel I could fall anytime. Anyhow, we reached the starting point safely. We were so excited. It could have been more exciting if there are more joiners. The water was so cold. My guide told me that the current wasn’t that strong yet but I could feel the tube will flip anytime. I firmly held on to the rubber handles attached in the tube so I won’t twist over. Thanks to my guide who also took care of me and navigate the tube so I won’t fall from the tube. The best time to get here is after rain as water level rises due to rainfalls making the current more stronger. After the ride, we went straight to the shower area and took a bath. Mabilisang ligo. Good thing that I didn’t let go of my urge on this activity. The travel time and the second attempt was all worth it. We paid our dues and left the area. We rode the same tricycle back to town proper then rode a van back to the city. We arrived in General Santos City with still have few hours left before our flight. 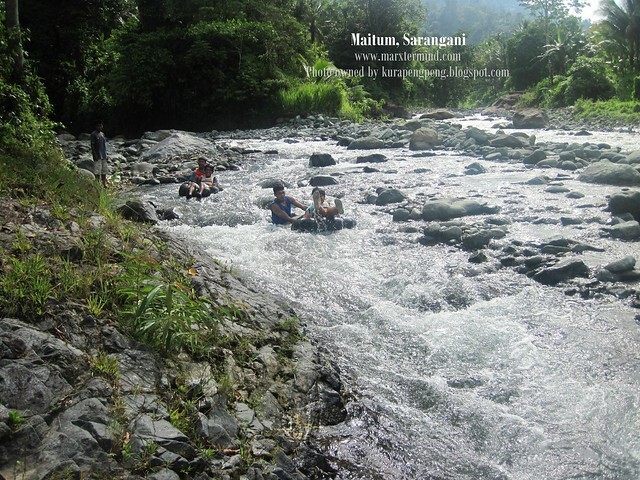 We hoped we could stay longer to explore more of Maitum, Sarangani. If I got time and budget I’ll definitely go back to this place. The tourist spots and attractions look promising making me wanted to explore more of this place. Note: Maitum, Sarangani and Lake Sebu are close enough when you check the Soccsksargen region map but there are no routes yet connecting these places. However, as of now (and as far as I know) there’s an on going road construction connecting these two places making it easy to transport in and out of Sarangani and South Cotabato. It may take 1 to 2 years to finish the road construction. For more details about it you may contact the local tourism of Sarangani or South Cotabato. Research on trip schedules to avoid messing up with your travel plans. Create your contingency plans as well. 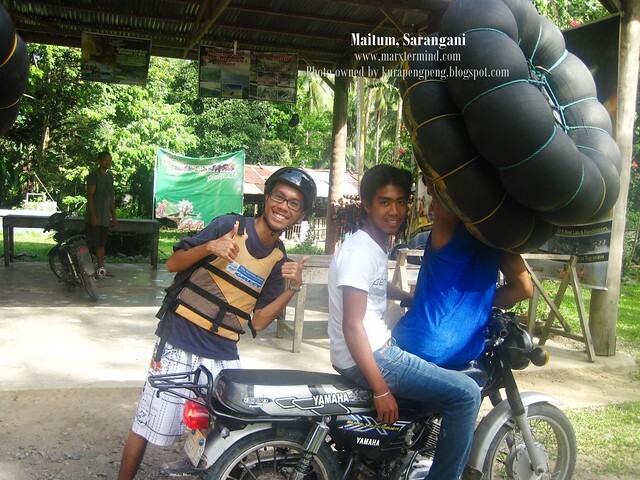 If you want to experience White Water Tubing, you may ask the van driver to drop you off at Baranggay Pangi and from there, there are motorcycle for rent (habal-habal) with PHP 25.00 fare each. You may also ride tricycles from the town proper with PHP 250.00 fare back and forth for the whole tricycle. The best time to experience White Water Tubing is after the rain when the water level rises. Wear goggles for sensitive eyes. Strongly hold on to the rubber handles to avoid being flip over. 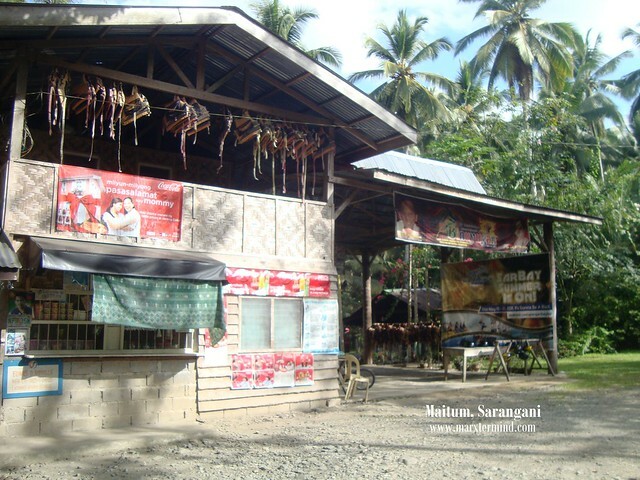 Contact the local Department of Tourism to know more about Maitum, Sarangani. Contacts are provided below. Nahulog lang sa habal-habal. 5 kasi kaming nakasakay non and rough road pa.
Just like rafting that goes solo. Cool to..lalo pag madami. Yung tipong sunod sunod kayo tas mahuhulog. hehe. Really fun! Si Maricar ba naman ang kasama. hehe.. Kaso nahulog daw ata yun guide mo? ako din may entry na. naunahan mo pa ko. hahaha! Masaya talaga to pag marami e no. chaka pag malakas ang ulan. Oh and yeah,tama ka. kasumpa sumpa ang habal habal. ahahaha! That looks exciting. Pero medyo nakakatakot `cos I don`t know how to swim. Nagpa-panic agad ako pag nasa tubig. Lol. wow ansaya~ im definitely adding this to my list! 😀 Must visit tlaga ang gen san! Nka punta kau sa nice beaches nila? Pano sumali? Hehehe. Yun nga plano namin ni Maricar incase di kami natuloy dito sa White Water Tubing, sasali na lang kami.